23.16 That's the end of the grandiose musical show Nomad Way 2018. Thank you for being with us all these three amazing days! See you at The Spirit of Astana on July 6-8 at the square near the Baiterek monument. 23.15 "The philosophy of our music is to wake up the blood of nomads, it's a great festival, it revives the memory of the nomads in our hearts," Sayan Bapa, a member of the Huun Huur Tu band said. 23.12 "I feel absolutely fantastic, I'm happy to be back here, we have done a lot of work, this is my second participation in the Festival. Before I have been to Almaty. Astana is a fantastic city. 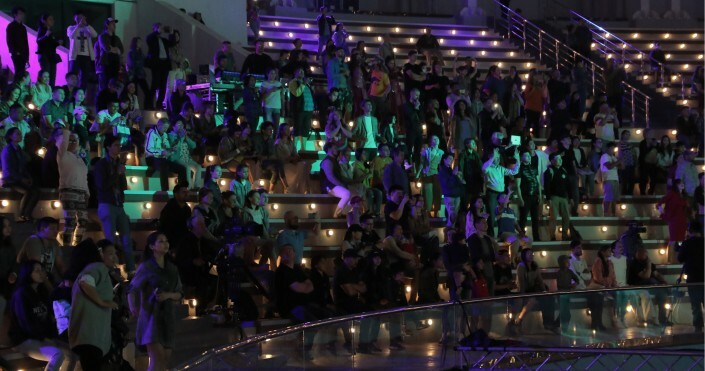 We could feel a tremendous vibe from the audience," American DJ Carmen Rizzo shared his feelings after the perfromance. 23.03 Despite the late Sunday evening and the coming weekdays, Astana residents did not want to drift away and again calling Huun Huur Tu and Dj Carmen Rizzo for encore. For the residents of the capital, the new amphitheater has already become a symbol of world music. 22.46 "This is a new venue, even I myself, living in Astana, did not know about it. I am always happy to discover something new in my own city, especially if it is important for our music. I congratulate everyone on a wonderful opening of the amphitheater. The Nomad Way always organizes festivals at a very high level. I hope we continue our active cooperation," Yedil Khussainov shared his impressions. Yedil & Satzhan Project play folk music and combine it with elements of jazz and electronics. Her compositions combine the music of Zhetygen, kobyz, dombra and sybyzgy. "Ethno-music is very interesting for young people, but it is not played very often. We need more festivals like that. They wake up love to Motherland," the band member Gulnara Koshenova said. 22.25 Huun Huur Tu and Dj Carmen Rizzo are performing now on the stage of The Nomad Way. The signature sound of Tuvan Huun Huur Tu is known in all corners of the world. Over their 25-year career, they have made joint recordings and performed with such outstanding musicians as Stevie Wonder, Frank Zappa, Mickey Heart and Bob Weir, Shankar and many others. A few years ago Huun-Huur-Tu began collaboration with the popular US DJ Carmen Rizzo. In 2009, the musicians recorded a joint album Eternal and went on a tour around the US cities. Carmen Rizzo has been twice nominated for the prestigious Grammy Award. The idea to make a joint project with Huun-Huur-Tuto belongs to him. 22.15 "The Nomad Way is the first step to Asia for us, It's a discovery of warm smiles, faces, new names and songs.We have chosen and performed a song called "Kyzdarai". And we can not help falling in love with it," the vocalist of the Ukrainian-Estonian group Svjata Vatra Ruslan Trochynski shared. The members of the band remarked the amazing beauty of the venue where the show is taking place this year. "I could feel very kind people who welcomed us so warmely, I definitely want to come again and learn more about your culture. We are from Estonia, we live close to the sea, so for us it's a completely different culture, yet very exciting," the member of the group and Ruslan's wife Terje Trochinski commented her acquaintance with the Kazakh culture. 21.45 The stage is greeting Kazakh master of throat singing Yedil Khussainov and the unique ethno-fusion group Satzhan Project. The musicians began their performance with a mesmerizing song "Kuz Bi". Yedil Khussainov is a master of a unique kind of throat singing. The musician has participated in many international festivals in Europe, the USA and Asia. The artist performs at such famous venues as Carnegie Hall (New York), Kennedy Center (Washington) and UNESCO Hall (Paris). Yedil Khussainov's music is a synthesis of the ancient and the modern. In his perfromance, he recreates and connects the era of the Kazakh ancestors - Sakas, Hunns and Turks. 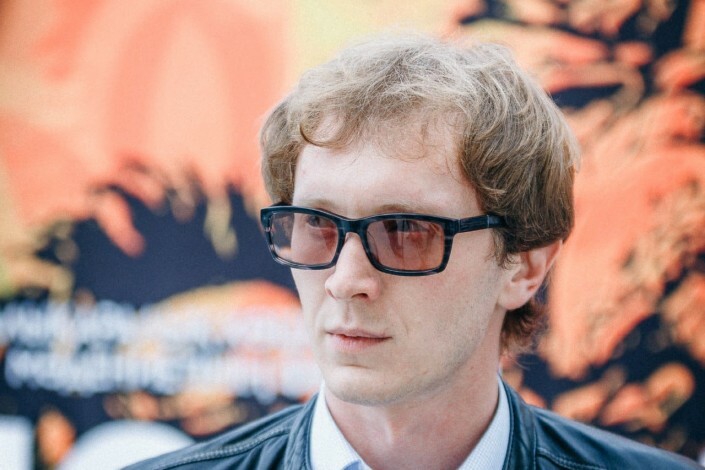 The Satzhan project was formed by a talented and promising composer, arranger and pianist Satzhan Shamenov in 2011. The young musician gathered around him such academic musicians as Kanat Omarov (saxophone), Nurbolsyn Toleuhan (trombone), Alexander Fisher (guitar), Ulan Akhmetov (bass), Marat Ahmedjanov (drums), Gulnara Koshenova (vocal), Aseli Rakhimzhan (kobyz), Aigerim Karsakbaeva (kyl-kobyz) and Almaz Sharipov (drums). The Satzhan project group is a synthesis of folklore genre with popular and jazz music. The collective actively participates in many Kazakhstan festivals and concerts. In particular, the performances of the project were remembered by guests of ethno-festivals The Spirit of Tengri and The Spirit of Astana in 2017. The group represents the country on the best stages of the world. They gave a concert at the World EXPO 2015 in Milan, as well as at the 5th Dushanbe Ethno-Jazz Festival Fusion Jazz Music (Tajikistan). 21.23 "It's very surprising and pleasant to be here again, we like Kazakhstan people and this atmosphere, we chose a song "Eki Zhiren" because this Kazakh song is very similar to our Hungarian music," Tilla Török's Band singer said. 21.07 And the stage is already meeting a fiery Ukrainian-Estonian fire-folk band Svjata Vatra. Their leader Ruslan Trochinsky played in the Ukrainian folk-rock band Gaydamaky from 1999 to 2004. In 2005 Svjata Vatra ("Holy Fire") band was formed. The band plays folk music based on old children's games and Baltic melodies adding some punk to them. Their song "Kalinka" was recognized as the best folk/world music song in Estonia in 2009. 21.03 The founder of group Ayarkhaan Albina Degtyareva noted that at The Nomad Way she enjoyed not just performing, but also watching other shows. "We work with our chords as musical instruments. We are modern saki, we feel responsible for communicating the memory of our ancestors to the descendants, our task is to preserve it, multiply it and transmit it in a new sound." Therefore, the sound of khomus is not quite traditional, it is used to be called avant-garde, now it is a new classics," Albina Degtyaryova said after the performance. 20.49 "The energy here is just wonderful. Last year I went to The Spirit of Astana for two days. Unfortunately, this time I could come here on the last day. I usually do not choose genres, listen to everything that I like, but ethnic music is the best "- Ilya from the audience shared his impressions. 20.12 "Nomad Way and The Spirit of Astana are the two largest music events in Astana, I am very happy that this has become a tradition. 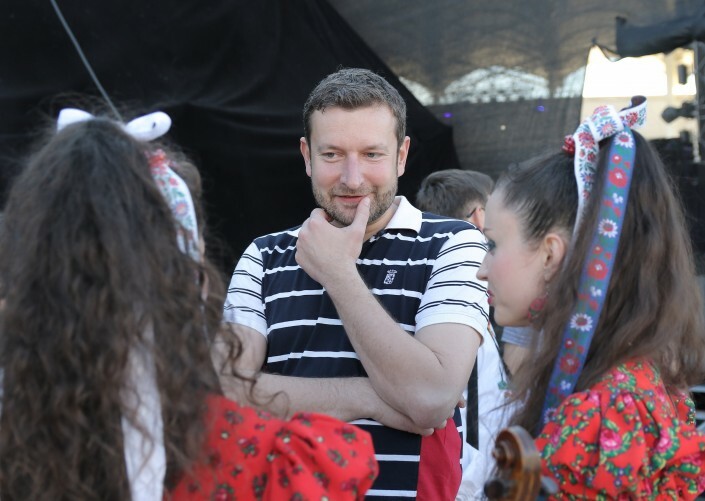 I have been living in Astana for three years already, and I am very pleased, when such cool events take place here, especially with Hungarian groups taking part in them," Hungarian Ambassador to Kazakhstan András Barani said after the performance of Tilla Török's Band. 19.50 Kazakhstani Dj Nariman Issenov has come on stage together with the Yakut trio Ayarkhaan. Ayarkhaan is a laureate of numerous international contests and festivals of ethnic and live music. Using only voice and khomus, the band can simulate the sounds of animals, birds and nature at the same time. A little later, an incredibly talented performer from Mountain Shoria Chyltys Tannagasheva will join the DJ. She is the first Shorian who has mastered throat singing. Since 2003, Chultys has many times become a laureate and winner of various competitions and festivals. 19.35 Hungarian Tilla Török's Band have performed the Kazakh song "Eki Zhiren". The audience is delighted. 19.22 "The main difference between this festival and the previous one is the venue, which allows us to create a completely unique atmosphere on the embankment of the Esil river, which is absolutely new, and we are actually the first to open it, as well as discovering the Nomad Way from a new technological perspective", the chief director and project manager of The Spirit of Tengri and The Nomad Way Sergey Maiboroda noted. 18.57 "We were at the Nomad Way last year, every time for us it's a meeting of friends, because there are a lot of bands we work together with. For me, every Nomad Way is a development and creativity, seeing others performing, learning their way of thinking, showing what we can do. It is this to be called mutual spiritual and musical development," Aleksey Chichakov, the soloist of Belukha Jam said. "I have known the sacred land of Kazakhstan for a long time, and every time I open something new for myself, the level of life and music does not cease to surprise and attract us.The Festival brings us closer. Our mission is to let Kazakhstan people learn more about the culture of the Altai Mountains. Here, I take, I learn a lot, " singer Bolot Bairyshev said. Each song by Bolot Baryshev & Belukha Jam is a wish to the listener for health, purification and mental peace. "We are going to the stage with a single thought to wish the good for the audience, to help them heal theis souls" he said. 18.34 Tilla Török's Band from Hungary are next to come up on the stage of the Festival. In their music the group combines Hungarian national music with melodies of nomadic peoples of the steppe in modern arrangements. The band has been participating in the project The Spirit of Tengri since 2015, and today's The Nomad Way is to be their second. In folk Hungarian music, the classical violin and lute, called "koboz" in Hungarian, enjoy special honor. Both the violin and the lute are well-mastered by the band's lead singer - Tilla. 18.07 "It is just the beginning but I already like the atmosphere. I personally love alternative rock, but this I hear for the first time. Amazing!" one of the audience Gulzira shared. 17.49 The third day of the Festival is opened by Bolot Bairyshev & Belukha Jam. Bolot Bairyshev is the Honored Artist of the Republic of Altai and the Russian Federation. He is a master of Altai throat singing kai and all the national instruments. Bolot is a regular participant of festivals around the world. Belukha Jam is a music band from Gorny Altai performing traditional Altai music in modern rock arrangements. Musicians perform Altaic tales, traditional wishful-thinkings, the alkysh, as well as their own original songs. The name of the band comes from the name of mount Belukha - a sacred place in the Altai mountains, located not far from the village of Ust-Koks, where the founder of the band Alexey Chichakov was born and resides. 17.45 Host Zhassulan Kali announced the start of the third day of the Festival. Let's go! 17.38 Hashtag #NomadWay in social networks has gathered a lot of interesting posts! Do not forget to put a hashtag on your post. The best of them will be included in our live-broadcast on Tengrinews.kz! 17.30 The Nomad Way Festival is about to begin. The amphitheater is ready to receive guests. Recall, on the back of the stage there is a wide LED-screen and powerful speakers. The show can be viewed from both sides of the picturesque embankment of Astana. We remind you that the entrance to the Festival is free! 17.25 "It can be said that the grandiose opening of the Nomad Way Festival has taken place just this year, last year it was a test, and this time it has already grown stronger, there is a lot more audience and for us this is a great victory. 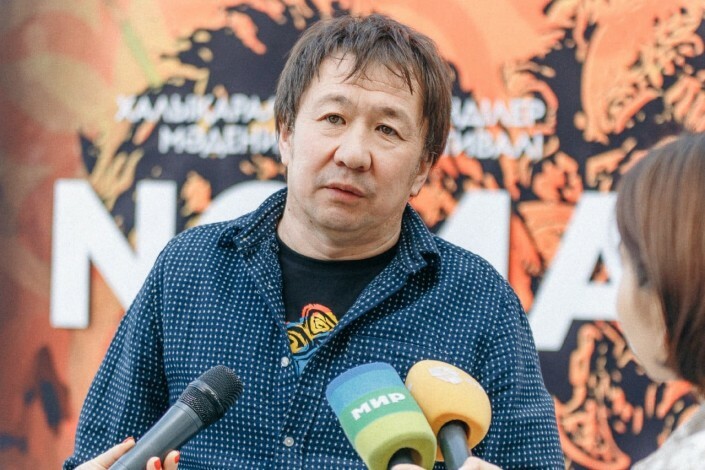 Next year, I think, even more countries will join us," the general producer of the The Spirit of Tengri and The Nomad Way, Zhan Kasteev commented on the opening of the final day of the Festival. 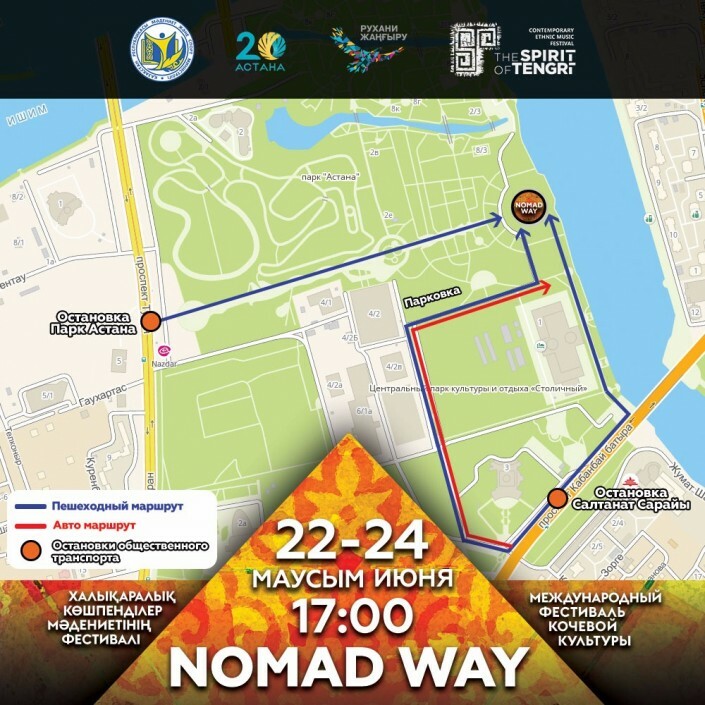 17.09 In Astana, the third day of the International Music Festival of Nomadic Culture Nomad Way 2018 is about to start. In the amphitheater on the embankment of the Esil River, the audience will enjoy fiery ethnic tunes, drive and high-quality live music. 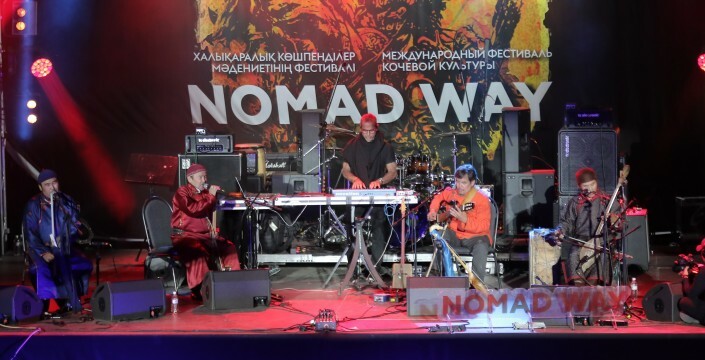 International Music Festival of Nomadic Culture Nomad Way 2018 is held with the support of the Ministry of Culture and Sports as a part of celebrating the 20th anniversary of the capital of the Republic of Kazakhstan - Astana. The official water of the Festival is ARZU. 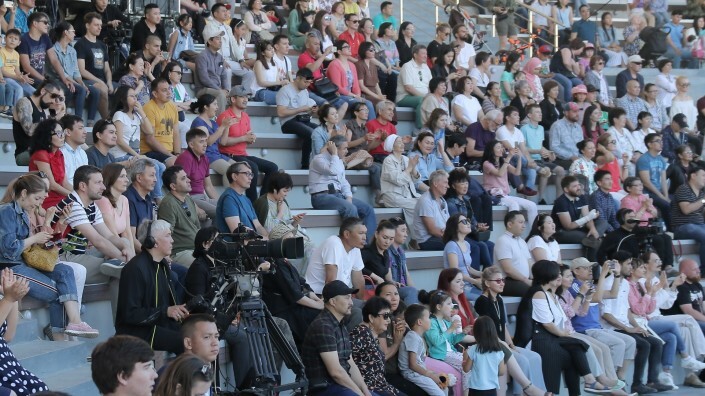 Taking place at the brand new stage of the amphitheater in Astana, the third day of the Festival guests will share excellent mood with the guests. Today meet Tilla Török's Band (Hungary), Bolot Bairyshev & Belukha Jam (Altai), Ayarkhaan / Chylytys Tannagasheva / Dj Nariman Issenov (Yakutia, Mountain Shoria, Kazakhstan), Svjata Vatra (Ukraine, Estonia), Huun Huur Tu & Dj Carmen Rizzo (Tuva, USA), Yedil & Satzhan Project (Kazakhstan). Traditionallly, Nomad Way 2018 will be available online on Tengrinews.kz and in the social network The Spirit of Tengri project. The live broadcast with a quality sound and a quality picture will start daily at 17.00. Online broadcasting can be viewed anywhere in the world. The ethno-festival is hosted by is Zhassulan Kali, the radio host and program director of Zhuldyz FM. 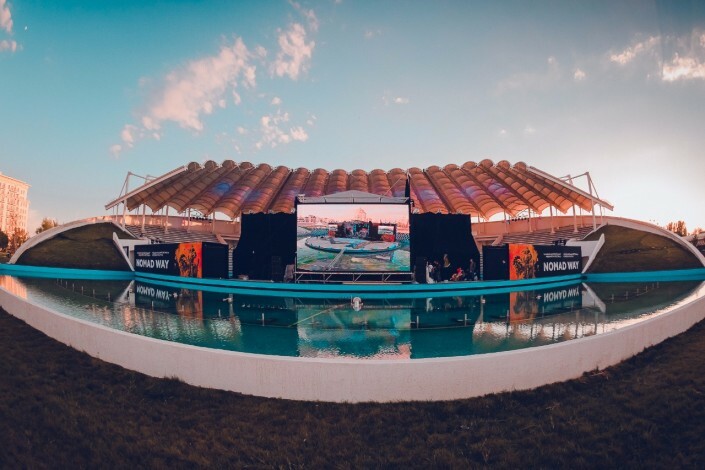 The venue of the Nomad Way 2018 is the amphitheater on the Esil River embankment. You can reach it bus routes No 18, 28, 32, 37, 44, 52 and 127. (Saltanat Saray stop, Kabanbay Avenue) as well as by routes No. 12, 17, 21, 36, 46, 50, 53, 54 и107 express (Astana Park stop, Turan Avenue). At the entrance to the amphitheater, a fair of handicrafts in ethnic style is opened, where the Festival guests can purchase children's clothes and toys, ornaments associated made from hypoallergic thread and wooden swords and axes for young warriors. Kamchas from the hooves of roe deer and horns of the mountain goat, real decorated shields of leather and metal, pendants and bracelets made of stones, corals and gems. Everything is made by hand using only natural materials and the technologies of the Turkic-speaking nomadic peoples. Moreover, at the fair you can buy souvenirs from The Spirit of Tengri: branded T-shirts, magnets, badges, and a anniversary DVD-edition that includes the best performances of artists in the history of the project. The Spirit of Tengri is a multicultural and one of the world's largest projects in the genre of contemporary ethnic music, with a status of a national cultural brand. Its purpose is to introduce the heritage of the peoples of the Great Steppe and the whole world, uniting the most iconic representatives of contemporary ethnic musical art on the Kazakhstani land. The project was established by the National Kazakhstan Radio Tengri FM in 2012. Musicians from 70 countries and regions of the world have been on its stage. Over these years, more than 100 thousand Kazakhstanis and guests of the country have been its visitors. The Spirit of Tengri festivals are bright colorful music shows accompanied by informational art materials and video content. Thus, they are not only entertaining but also educational. Photos are provided by the concert photo site ONParty.Me. Photographers: Gleb Terletsky and Artem Chursinov.